This class has prerequisites, please see full description. *This class has prerequisites; please see below. 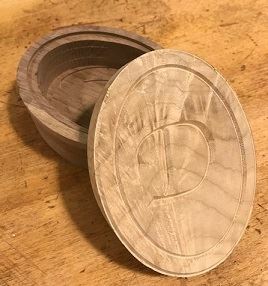 Learn to operate BARN's new Laguna CNC woodworking router and go home with an oval lidded box with custom engraving. Open to students who have beginning skills in Fusion 360, this class will introduce you to this design program’s CAM (computer assisted machining) functions. At the first session, you will work in Fusion 360 to design your box. Starting with a standardized design, you will tweak the design and create custom engraving to add to the lid. At the second session, you will use the CAM functions in Fusion 360 to develop tool paths for the router, output G code to run the router, and use the Laguna CNC to cut out and embellish your wooden box. You will make the box from maple and walnut. With the lid, the box will be 5¼ inches long, 4 inches wide and up to 3 inches high. At the end of class, your box will be ready for sanding and finishing. *This is an intermediate-level class, open to students who have completed Woodshop Tool Safety Checkout 1 and Intro to Fusion 360 CAD/CAM for CNC Machines. You must bring a laptop computer with a mouse and a working copy of Fusion 360 already downloaded to that computer. Please note that each session has different start times. Instructor: Chris Stanley is a model maker, artist and educator. For 19 years, he taught model making and design as a full-time instructor at the Art Institute of Seattle. He currently teaches classes here at BARN in jewelry, metal fabbrication, sheet metal, and now woodworking. Bill Gray will assist.